Daily Disposable Soft Contact Lenses - Try Now! Daily disposable lenses have the advantage of having a fresh clean new pair every day. No need to clean. Good optics. Healthy. No additional cost of contact lens solutions. Many parents like these for their children. They are great for everyday wear, or just for sports or special occasions. Some people like the flexibility of switching back and forth between eyeglasses and contact lenses and want to wear their lenses a few times a week. Multifocal – clear vision both distance (driving) and near (computer, reading). Most people begin to notice difficulties witching between distance and near at about 40. These lenses address that. Astigmatic for those people who have the need to see clearly because of the unique shape of their eye. All of these are FDA approved and have been available for a long time. Non-Daily Disposables have the benefit of reduced cost, but they must be cleaned and removed. Lenses used for longer have more build-up on the lenses from your tears, and it can, therefore, become more difficult to see clearly. As there is more build-up from your tears, mucin, and protein, the less air (oxygen) gets though and therefore more prone to eye health problems. As someone works on the computer or reads for longer amounts of time, these lenses tend to dry out and cause the eyes to feel dry. For many years, 2-week lenses had been popular. A problem is that it is hard to keep track of when they were last replaced. 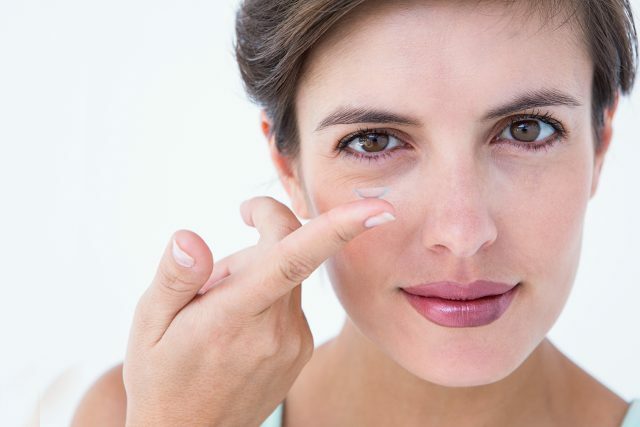 People tend to then over-wear their lenses beyond the lifespan they are FDA approval for, and this increases the possibility of complications. The benefit of 1-month lenses is that it is easier to keep track of when they were replaced.